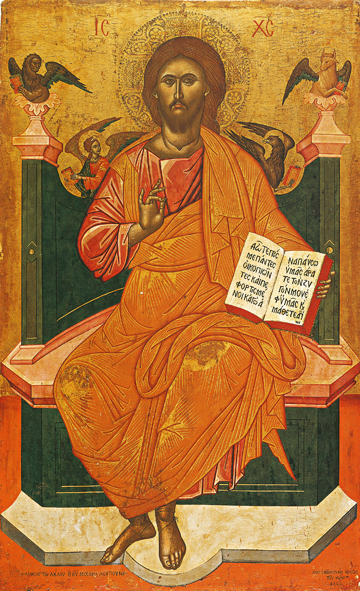 The Lord Almighty sits on a throne as the Ruler of the universe, and in His left hand He holds an opened Gospel. With His right hand He blesses with the priestly blessing, the fingers of His hand forming the Greek letters “IC XC”, which is the abbreviation for “Jesus Christ”. In Christ’s halo are the Greek letters for “I AM”, for this is the King of Kings as spoken of in Revelation (1:8), “I am Alpha and Omega…saith the Lord, Which Is, Which Was, and Which Is To Come, the Almighty.” On the upper part of the throne are symbolically represented the Four Evangelists: Matthew as a young man, Mark as a lion, Luke as an ox, and John as an eagle. All four have wings to portray their angelic nature and all carry Gospel books, for they proclaimed the Good News to the whole world through the Gospels that they have written. It is important to note that often when we focus on Christ’s amazing love for all creation, and His great condescension and humility in coming to us so approachably, we can lose sight of His Divinity, which was and is always present for those who see with sober sight and awesome awareness. May we see this also!